Choose different species category from drop-down list and press 'Go' button. Weavers often nest in palm trees, especially where palms are common, eg. islands and along the eastern coast of Africa. 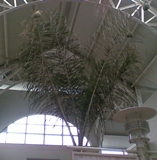 Palms used by weavers include Raffia palms (eg. PHOWN 4162), Phoenix reclinata (eg. PHOWN 1287), Coconut palms (eg. PHOWN 2426), Date palms (eg. PHOWN 1178), and Asian palms (eg. PHOWN 7058). Literature records include Borassus palms (Bannerman 1949a), and oil-palms (Sclater 1933a). Palm trees are often tall and with long unbranched stems but even so may be vulnerable to predators - a boomslang reached Cape Weaver nests but was unsuccessful in this case, see PHOWN 18517.
tree ferns - 1 record of weavers nesting, see PHOWN 18617). cycads - 2 records, Oschadleus 2006a and Reid 2007a. agaves - only in banana trees, eg Priest 1936a, and PHOWN 1002). Strelitzia - 1 record but without photo at PHOWN 16929). Southern Red Bishop - see PHOWN 18839. Zanzibar Bishop - see PHOWN 683. Participate If you know of weaver nests in palm trees, please take a photo and submit the record to PHOWN, PHOtos of Weaver Nests, by uploading photos to Virtual Museum (read the "How to" pdf for help). Read more about palm trees here.